The rich history of the credit union dates back to 1849, when Frederich Raiffeisen pioneered the concept of a rural credit society in Southern Germany. Modern central banking was initially reserved for the wealthy – those who had both money to hold and money to repay. For the socio-economically inferior, banking was less likely. In 1864, Raiffeisen established the first ever cooperative lending institution, thus the first effective credit union. The purpose of the credit union was to create a way to help the un-served and under-served, such as farmers or other non-wealthy locals, to enjoy the same necessary benefits from banking. Financial reputations were no longer the only criteria. Most credit union members were accepted based on additional factors, such as maintaining a good reputation within, or providing a service for, the community. By 1900, word had spread all the way to Quebec, Canada, where Alphonse Desjardins founded the first cooperative financial institution in North America. Shortly thereafter, the concept was adopted by Pierre Jay, the Finance Commissioner of one of America's great pioneer states: Massachusetts. Once in America, credit unions gained rapid popularity due to vast rural lands and incredible agriculture. By June of 1934 US President Theodore Roosevelt signed the Federal Credit Union Act (FCU Act), which authorized federally chartered credit unions in all US states. Credit unions were supervised by the Federal Deposit Insurance Corporation (FDIC) until 1970 when the National Credit Union Association (NCUA) was formed. This same year, assets in credit unions tripled. In 1998 US President Bill Clinton signed the Credit Union Membership Act to restore membership flexibility for credit unions, and in July of 2010, US President Barack Obama signed the Dodd-Frank Act, in part amending the FCU Act to allow a standard maximum share insurance amount of $250,000. This amount was thus far only enjoyed by banks insured by the FDIC. Though credit unions have evolved over time, the idea of serving individuals and the community first has remained the fundamental distinction from banks. BMI Federal Credit Union was created in 1936, shortly after the passing of the FCU Act. A small group of employees of the Battelle Memorial Institute came together to promote this new cooperative concept. 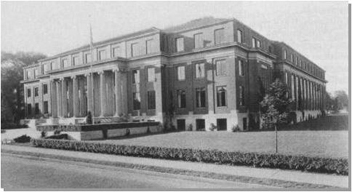 The Battelle Center was founded by Gordon Battelle, who devoted his life and legacy to advance innovation, science, and technology for the purpose of societal benefit. The fundamental belief of the employees of Battelle and BMI Federal Credit Union was to always put their members first, by ensuring their low rates and benefits were reserved for members, not shareholders. We are proud of our great history of protecting our citizens and promoting community wellness, and look forward to serving you for years to come.